Dacia Gallery has a year round open submission policy for our monthly exhibitions and accepts artwork from emerging and established artists in all media: painting, drawing, printmaking, sculpture, photography, digital art and mixed media. You may submit your artwork as a “general submission” or to a specific exhibit that we have listed below. All artwork submitted is reviewed by our curatorial panel and kept on file to be considered for each upcoming exhibition. Dacia Gallery does not charge an exhibition fee to artists to show their work, we select and show artists based on talent. Participating artists in our exhibitions will be announced on our website after the entry deadline for each exhibit. If your work fits a particular exhibition you will be notified directly by the gallery. Group Exhibition: Dacia Gallery invites emerging artists to submit artwork for an opportunity to participate in upcoming Group Exhibitions for 2019. We are looking for a diverse body of artwork in all mediums and styles, this will be a group show comprised of artwork created by contemporary artists, exhibiting what is being created on today. If you are looking for gallery representation and to have a Exhibition in New York City, submit your art that we may discover your compelling work and present it to the public, gallery directors, curators and collectors. Who Can Participate: All visual artists, national and international artists may apply. The Exhibition: Dacia Gallery will advertise and promote the selected artists for our Group Exhibition and host a formal Opening Reception for the exhibit, including an Artist Talk during the opening reception. How Are Artists Selected: Dacia Gallery has three jurors that review and select the artists that submitted their work. The jurors VOTE through a process of elimination, whoever receives the most votes simply gets to be in the show. Accepted Artwork: Painting, drawing, sculpture, printmaking, photography, digital art, mixed media, illustration, etc. In other words, all creative culminations are welcome. Submit Your Work Today: We are actively searching for new talented artists. If you are looking for gallery representation and to participate in a Group Show in New York City, submit your art that we may discover your compelling work and present it to the public, gallery directors, curators and collectors. To submit: Please be ready to provide your artist bio, (see our website for examples) and artwork list (i.e. title, medium, dimensions and retail price for each artwork). Please include your name, address, email and phone number on your artist bio and artwork list. Curation Fee: You may submit up to 10 images for a curation fee of $35.00. Payment of the curation fee is final. Additionally: Save and label all your image files: Title, name, medium, dimensions and retail price, Example: Untitled, Michael Smith, Oil on Canvas, 20x30, $100. Dacia Gallery charges 50% commission on all artwork sold during exhibitions. IMPORTANT: To receive a notification e-mail on the selected artists register your email: Click Here. To Submit for the Group Show Click Here. Group Exhibition participating artists will be announced on the Dacia Gallery website after the entry deadline. 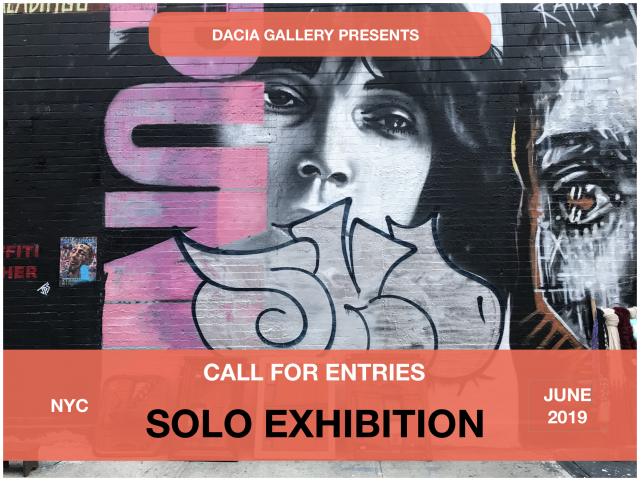 Solo Exhibition: Dacia Gallery invites emerging and established artists to submit artwork for an opportunity to have a Solo Exhibition at Dacia Gallery in NYC. We are actively searching for new talented artists in all media and styles to work with, exhibit and represent. If you are looking for gallery representation and to have a Solo Exhibition in New York City, submit your art that we may discover your compelling work and present it to the public, gallery directors, curators and collectors. The gallery will advertise and promote the selected artist for the exhibition and host a formal Opening Reception for the exhibition, including an Artist Talk during the reception. We look forward to discovering your artwork. The Exhibition: Dacia Gallery will advertise and promote the selected artists for the Solo Exhibition and host a formal Opening Reception for the exhibit, including an Artist Talk during the opening reception. Accepted Artwork: Painting, drawing, printmaking, sculpture, photography, digital art, mixed media, site-specific installations, illustration, etc. In other words, all creative culminations are welcome. Additionally: Save and label all your image files: Title, name, medium, dimensions and retail price, Example: Untitled, Olivia Smith, Oil on Canvas, 20x30, $100. Dacia Gallery charges 50% commission on all artwork sold during exhibitions. To Submit for the Solo Exhibition Click Here. Group Exhibition participating artists will be announced on the gallery website. Artists, good luck and we look forward to seeing your work. 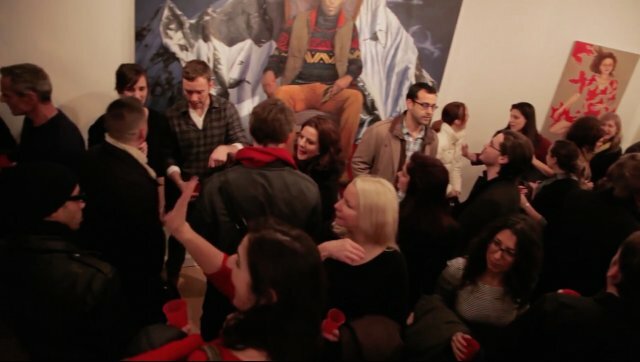 To see a video of an opening reception and artist interviews at Dacia Gallery click image.